Make your drug discovery more efficient with high fidelity electrophysiology and very low labor requirement. Qube runs unattended with its stacker feeding compounds and biochips and the onboard cell hotel supplying the cells for many hours of screening freeing up your important research time. Make your drug discovery more efficient with high fidelity electrophysiology with very low labor efforts. The Qube stacker together with the integrated cell preparation unit (QFuge) enables fully unattended operation for 16 QChips or more than 6000 wells before any user intervention is needed. Depending on the assay length and cell viability one click can enable unattended operation for 6-10 hours creating results from more than 6,000 compound wells with single addition per QChip or up to over 30,000 compound wells with cumulative dose response assays with 5 doses per site. Using Sophion Qube with the integrated stacker frees up labor to do more important tasks like preparing your next experiments, interpretation of data etc. The data generated on Qube are analyzed continuously and automatically in Sophion Analyzer project analysis so every time a QChip has been assayed fresh data can be enjoyed from anywhere with a connection to the company network. Qube gives the potential to shorten campaign time since it runs with stacker and no user intervention long beyond normal office hours (Fig. 2). Figure 1. Qube assay with stacker. Nav1.4 current was elicited with a two-pulse protocol and the effect of 30 µM tetracaine was evaluated. The stacker was loaded with 16 QChips and 16 compound plates, the “run” was started at 4:24 pm. 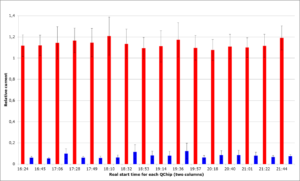 The relative current in the presence of tetracaine (blue) and respectively saline (red) is plotted for each plate throughout the run against the time stamps for each the start of each QChip. Figure 2. 16 compounds plates were assayed with alternating rows of tetracaine and saline control. The analysis was performed to detect block. The amount of block is color coded with more than 50% block colored blue and red denoting no block. White wells indicate those removed due to quality filters. It can be seen that there are no false negative or false positive results as can be seen by the absence of blue wells in the red rows and vice versa. When compounds are exposed to plastic, which they commonly are in HTS, they can adhere to the surfaces thus decreasing the concentration in the media. To reduce the risk of inaccurate measurements caused by compound adherence, Qube can dilute stock solution 1,000-fold directly in the compound plate just before the assay run. This feature not only makes data more precise but it also reduces the need for other laboratory equipment. High throughput can both be used to do primary screening and to create compound characterization on many compounds in many replicates. Regardless, the Sophion Analyzer makes the data analysis easy and quick, freeing up the time to interpretation and planning for next steps in the drug discovery process. The tips used by the Qube 384-liquid handler are reusable and are washed in water and/or solvents after each liquid addition. If needed, Qube can also automatically exchange the tips during a run at any desired frequency. In the run depicted in Fig. 2 tips were exchanged for every third QChip. When 16 QChips have been assayed, it takes 5-10 minutes of operator time to supply news cells and exchange the cell waste container before pressing “run” again to initiate the assay of a further 16 QChips. The QChips and compound plates are designed to be preloaded into each of the two stacker towers. The towers detach easily from the stacker base and can pick up the entire stack of plates by lowering it on the stack. It is also possible to load the plates from the top of the towers so Qube can be started as soon as the first compound plate is ready with the rest being loaded continuously. The barcode reader in Qube will of course keep track of everything. The capacity of the towers is 40 plates of each type. Qube comes in three configurations 1) Qube 384 basic, 2) Qube 384 w stacker 3) Qube 384 integrated into an HTS line. The Qube can be up- and downgraded at your convenience. A stacker can be mounted to convert a basic Qube model to a stacker version and the user can be trained in less than a day. The Qube maintains it’s ‘good looks’ with all connections and supplies to the stacker come directly from inside the instrument and all communication being achieved via the Sophion ViewPoint software. The stacker unit is manufactured by Hudson® robotics, but other brands can be requested. In such cases customization would be required. At Sophion our first choice was to integrate a Hudson stacker because they provide the best software interface and sensor output.